I spent the morning today with a small group of people with memory loss at a local adult day program. Besides playing some games, we talked with one gentleman about his time in Germany after WWII. He shared that while there, he taught a German some English and that person, in turn, taught him some German. But this gentleman could not finish telling his story, as he lost his train of thought in his communication. So I re-initiated the conversation by asking him if he remembered any German. Bam! - he went immediately into speaking fluent German - no halting conversation or loss of words anymore! I am happy to be present when these moments of clear thinking come to people, with the right prompts. Skip open-ended questions, such as "How was that experience?" Instead ask yes/no or multiple choice questions, such as "Did you travel alone or was someone with you?" When someone gets stuck in their conversation, repeat back part of what they have said and validate the feeling of what they were trying to tell you. For the gentleman in the example above, he was told "Sounds like you had lots of adventures during your time in Germany." This affirms that the person has communicated something to you, even if it was not the full story. It gives the person a sense of success and may save him from a moment of frustration when communication has come to a halt. Start conversations that revolve around common, memorable events or seasons. For example, other conversations we had today was talking about who liked to plant gardens in the summer and the upcoming Fourth of July celebration. Use props during conversation. For example, before we played our card game, I showed the group the game cards and we talked about what cards games people liked, which included bridge, Blackjack, and cribbage. If you share a story yourself, keep it short and simple. Adding a bit of humor is always a good choice! 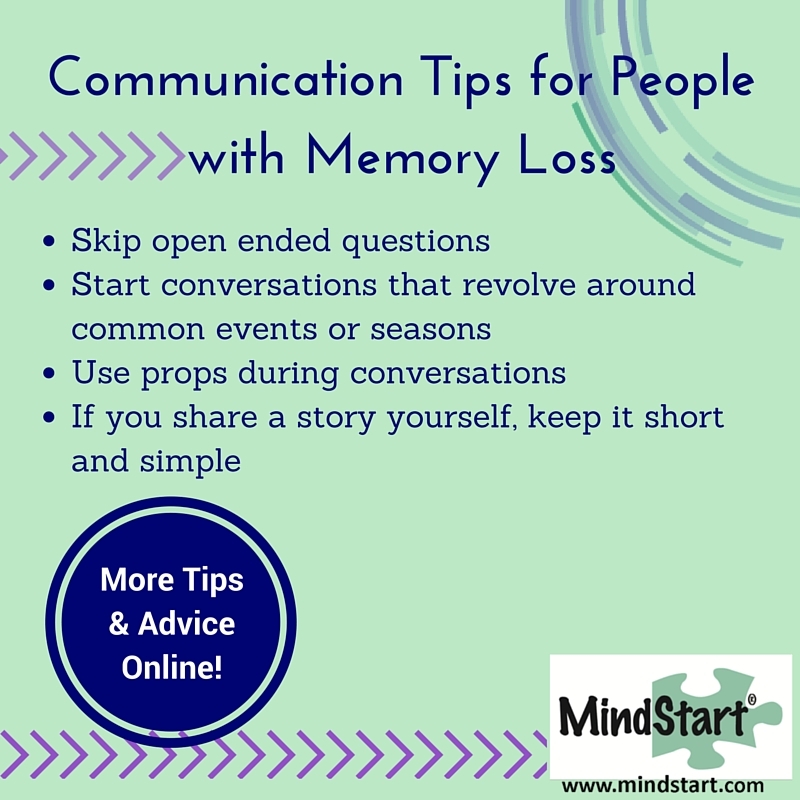 Conversations can be difficult for both the person with memory loss and the visitor, but with these tips, can be successful and enjoyable. Trying an activity together can also help to improve communication.